Tuvalu 2010 Stamp Expo, Shanghai, China. I am not sure what "Green Island is Tuvalu Life Line" means. Tuvalu is a barometer of the health of Planet Earth. An > 2 degree rise in mean temperatures, results in a sea level rise of 1 metre, the death of Tuvalu. Global warming is a concern in Tuvalu since the average height of the islands is less than 2 metres (6.6 ft) above sea level, with the highest point of Niulakita being about 4.6 metres (15 ft) above sea level. Tuvalu could be one of the first nations to experience the effects of sea level rise. Not only could parts of the island be flooded but the rising saltwater table could also destroy deep rooted food crops such as coconut, pulaka, and taro. I have never been to Niulakita, but I have been on the highest spot of Funafuti, about 12 ft above sea level. This is a great film to explain the Tuvalu lifeline. "When the ice melts in Thule, Tuvalu drowns in the Ocean"
The Ice is cracking up in Thule. 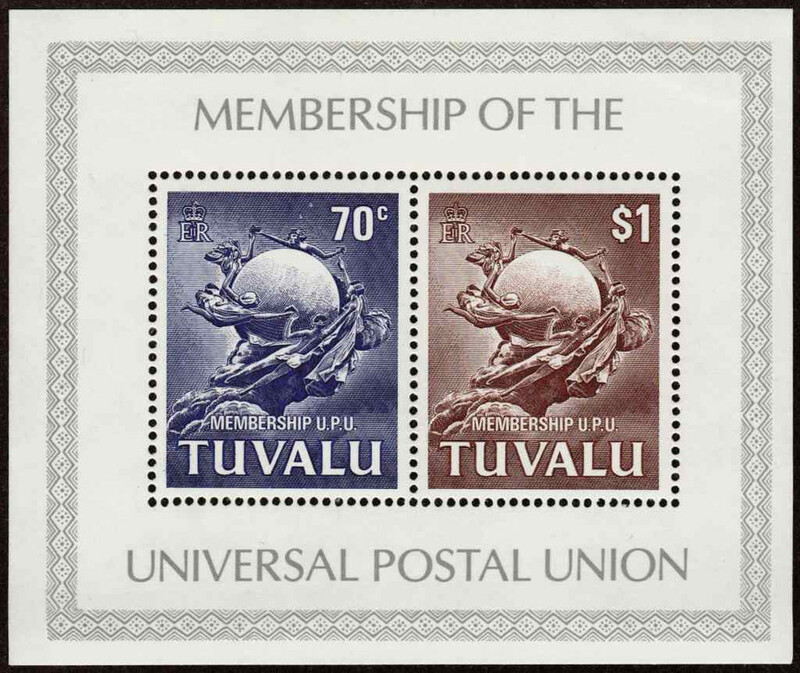 Tuvalu was admitted to the Universal Postal Union on February 3, 1981. This 2-stamp souvenir sheet (Scott 165a; Nov. 19, 1981) commemorates that membership. The perf. 14.5x14 stamps are a 70c dark blue (Scott 164) and a $1 dark red brown (Scott 165).